In order to ask for the deletion of the certificate below, please click here. delivered to his owner by Joana-(e-dashura-me-e-mire) ! Certificate will be sent to the specified email address. 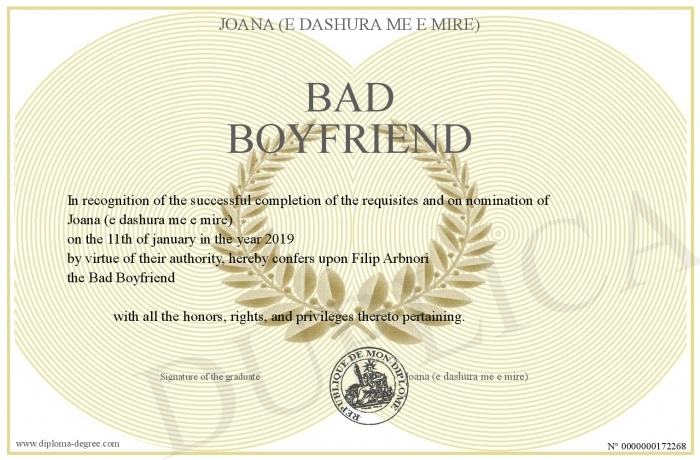 This certificate has been created by Alfred, holder of the absolute Truth, 2 times world champion of gymnastic, creator of the first free cash register of the word, 1st man to walk on the sun, French version of this website available on www.mon-diplome.fr or permis de conduire or , see also . Any attempted tampering or alteration is prohibited.